I was made aware of a story published in Memphis today about Elvis Presley Boulevard, a STROAD (street/road hybrid) that is going to be worked on in an upcoming project. In my time in Memphis, I was able to look at this project and the problems/solutions were obvious. This corridor needs to become a place, not just to present a respectful gateway to Graceland, but for the adjacent lands and neighborhoods to prosper. Fortunately, to transform this STROAD from a corridor solely purposed for moving cars to a place that creates value for the community is simple. It will likely even cost less than what is now being considered, and it will certainly have a much higher rate of return. I'm diverting momentarily from our coverage of CNU to give you two pictures from Chico, CA. The first is a standard STROAD that looks similar to the current Elvis Presley Blvd. Throw in some decorative lighting and a few superficial accoutrements, and you essentially have what I understand is now being proposed. 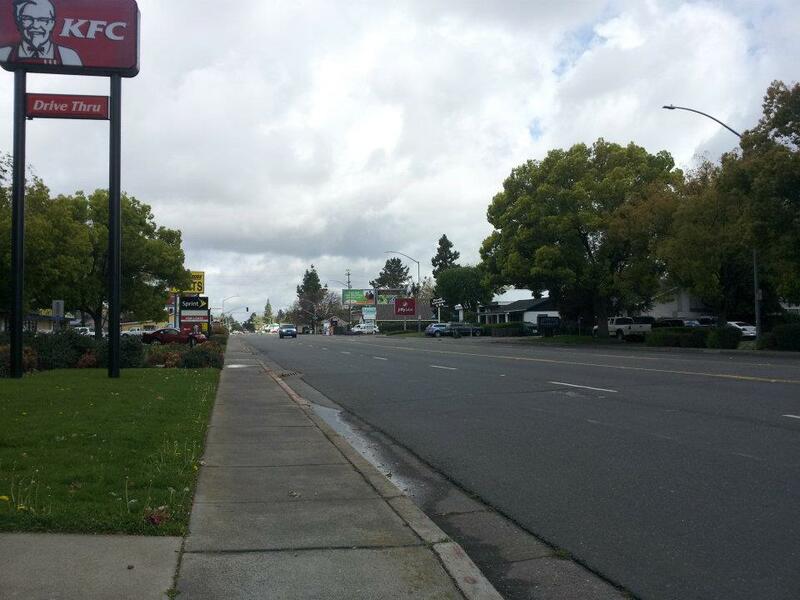 Mangrove Ave., Chico. Average Daily Traffic: 29,000Here's another option for Memphis to consider. This is the Chico Esplanade. It actually carries more traffic than the STROAD and, as you can see, creates not only a more pleasant environment, but is a platform for some really amazing (and valuable) adjacent land uses. What you are seeing here are four center driving lanes and two parking/access lanes separated by a median. Esplanade, Chico. Average Daily Traffic: 35,000Now this has matured for some time -- Memphis is obviously not going to have this type of vegetation in 2013. However, that can happen over time, as well as a maturing of the current land uses along Elvis Presley Blvd., with a design like this. And Memphis, if you look closely, you already have an uninspired version of this same design right in front of Graceland. Put a little more love into it (and find someone who knows spatial design) and then extend it along the entire corridor and this place will pop. This is a fantastic opportunity. I wish you all much success.